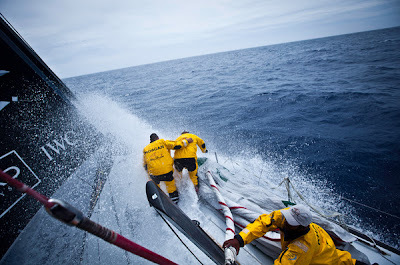 The quick Atlantic crossing to Lisbon, Portugal, has taken an unexpected twist, as the cold front the fleet had been hoping to hook into for a fast ride fast across the North Atlantic was moving too quickly, slamming the door shut and forcing some quick thinking. 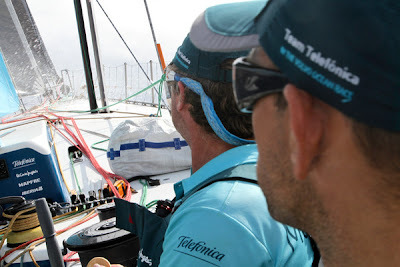 “We all missed the train and we’re waiting for the next one, which is expected to come in from the northwest and that’s while we are climbing up,” explained Xabi Fernandez, trimmer with leg leaders Telefónica (Iker Martínez/ESP). Having missed the opportunity for a fast ride towards the finish, the fleet has gybed north and are heading towards the ice gates put in place to keep the fleet south of the ice brought south on the cold Labrador current. “The latest bit of ice was spotted at latitude 46 degrees north. At the moment we’re headed to get above it. 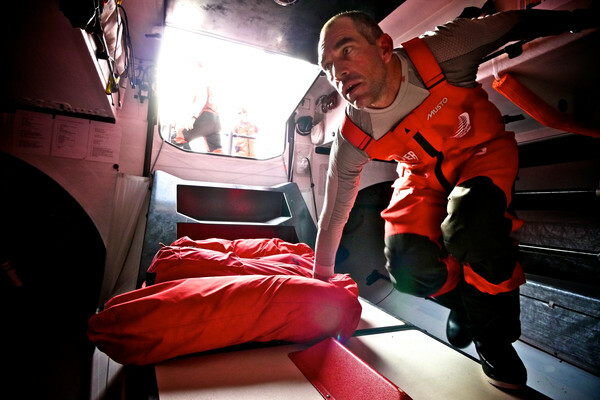 Bring on the freeze,” said Abu Dhabi Ocean Racing’s navigator, Jules Salter. “The boats behind have a bit more breeze right now, so they’ll be notching up some good data in the next few hours. The situation we have coming up is quite thorny indeed. We’re going to hit a high pressure system tomorrow and then we will get the next squall, where we hope we’ll get away again. 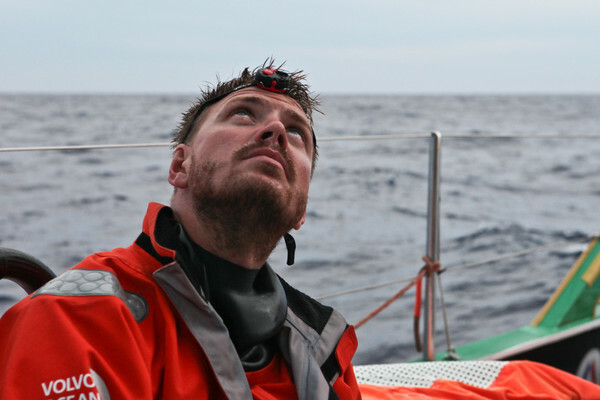 It will be interesting,” said Telefónica navigator Andrew Cape, who made the call to head east again shortly after 1300 GMT. For CAMPER with Emirates Team New Zealand (Chris Nicholson/AUS), who found themselves further south than they wanted, it has been a particularly painful two days following the decision by the afterguard to abandon the south and take the high road north. “We took a couple of big shifts to the north. The remains of tropical storm Alberto were still around, so we got a bit of a shove from that. 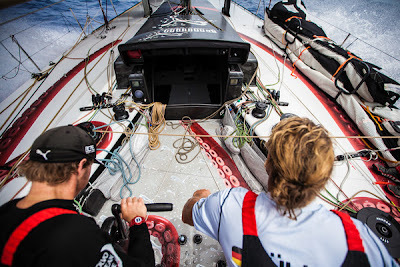 Right at the moment, we are reaping some of the benefits from it,” explained navigator Will Oxley earlier. The leaderboard reshuffled at 1600 GMT today, with Abu Dhabi Ocean Racing (Ian Walker/GBR) moving up to second place, with CAMPER eight miles behind and Groupama slipping to fourth. 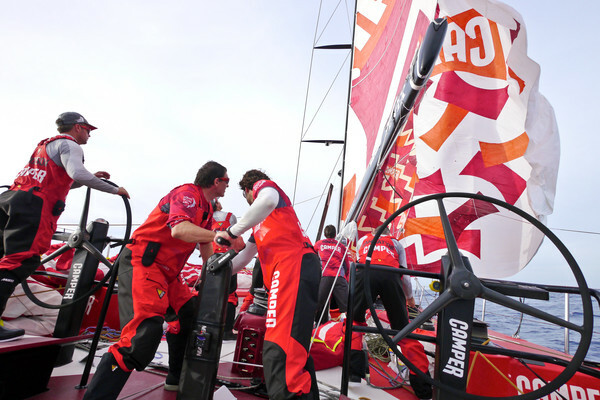 At 1900 GMT Groupama had slipped further down the field to fifth place. Having hit a light spot, the team was sailing at almost half the speed of the rest of the fleet. 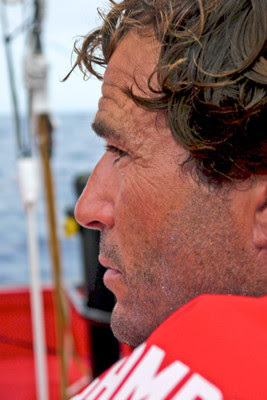 They are positioned midway between Telefónica who is heading east and the rest of the fleet who are continuing to claw northeast. 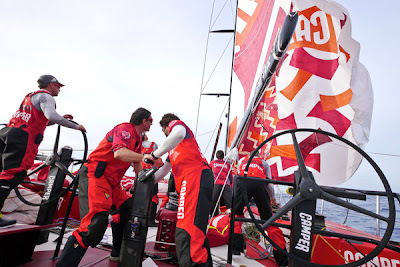 The fleet is now spread 65 nm from Telefónica in first to Sanya in sixth place, with a north/south divide of 68 nm. So far, the course from Miami to Lisbon has produced flat water downwind sailing under clear blue skies, unexpected conditions enjoyed by all. 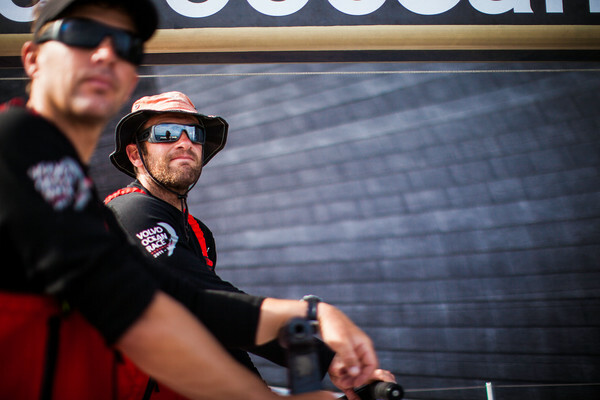 “Normally it’s grey, miserable and cold and probably freezing at this stage, as we are usually up around Newfoundland, so we will definitely take this,” said Justin Slattery, bowman with Abu Dhabi Ocean Racing. Far from being a drag race to the finish, the current weather situation, although tricky, has presented plenty of options for the chasing pack who are picking their way through the minefield. Fortunately, although many miles have been lost in the claw north, there is still over 2,000 nm left to run in this 3,590 nm leg to Lisbon, which is plenty enough runway to provide for some changes in the leader board.